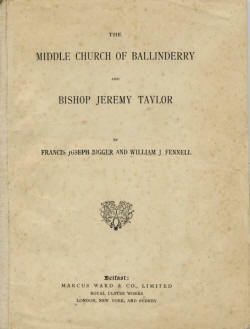 The Middle Church of Ballinderry and Bishop Jeremy Taylor. BY FRANCIS JOSEPH BIGGER AND WILLIAM J. FENNELL. 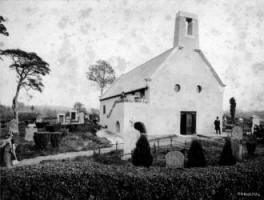 HIS church stands westward from the modern village of Ballinderry?" 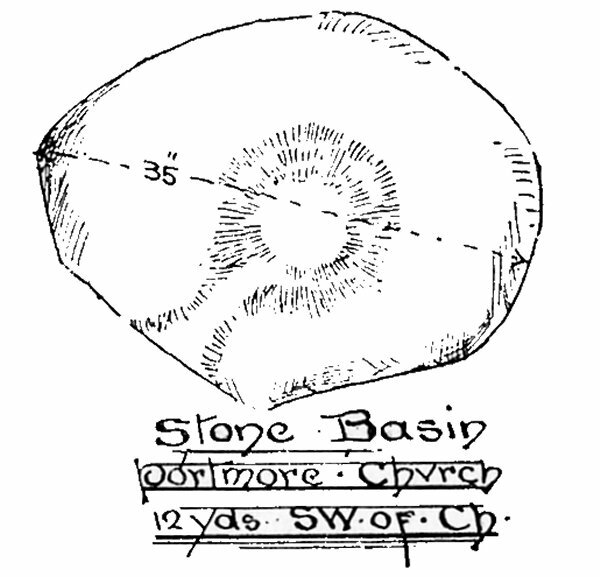 the town of the oak " - and eastward of Portmore and Lough Beg.' The district is filled with the associations of the troubled life of the earnest and eloquent Jeremy Taylor, Bishop of Down, the Shakespeare of divines. 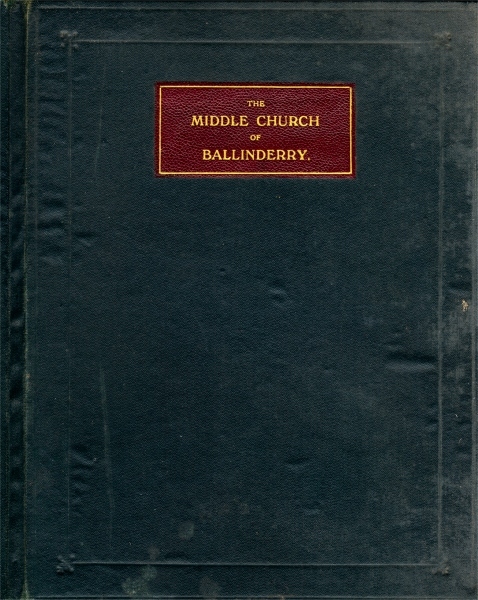 1The old village of Ballinderry was near the Church of Portmore, which is situate in the townland of Ballinderry, and not Portmore, and, being the largest townland, doubtless gave its name to the whole parish. 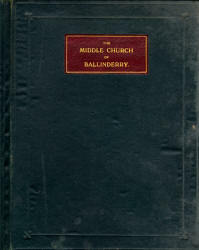 At a later date " Ballinderry" was at the " Cross Roads," whilst the present railway station has caused the centre to shift further east to what was called the " Upper Lane Ends," or Upper Ballinderry. sumptuous joinery. 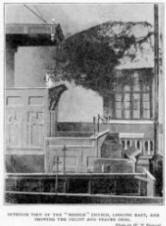 It was erected by Lord Conway in 1664, upon the site of a former stronghold of the O'Neills.1 Still, as one wanders over its site, there comes to mind a vision of the gifted divine who here thought to find, as he himself expresses it, " retirement in that solitary place," under the protection of its owner. The little Sallagh island in Portmore Lough where he penned some of the thoughts that have immortalised him, possesses no vestige of his arbour, and is now " an unweeded garden ; " but it was once the loved spot where, in solitude, the devout Taylor gave his soul its full freedom to think and record the thoughts bright, clear, and beautiful like the waters around him. 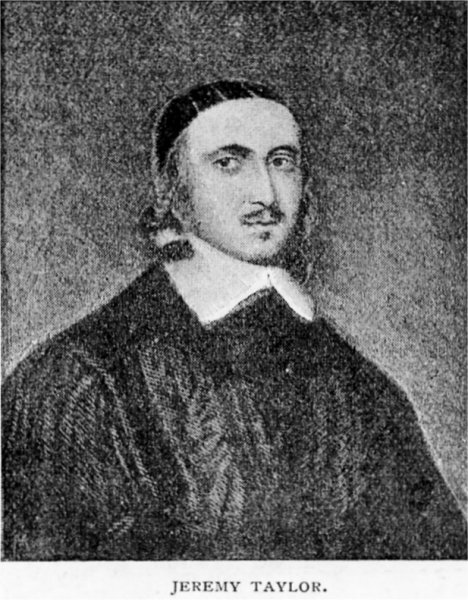 From here he dates one of his letters " June 4, 1659," and states that here his " little boat has cast anchor ; " and the Preface to Ductor Dubitantium is dated " from my study at Portmore, in Killultagh, October 5, 1659." 1This castle was pulled down in 1761. The deer park contained 1,000 acres, and was stocked with deer, pheasants, and other game. Earl Conway, in his correspondence with his brother-in-law, Sir George Rawdon, expressed his desire to introduce all useful and ornamental productions into his park and lake. These included hemp-seed from Flanders, cranes and decoy ducks from England, also numerous trees, shrubs, roots, and seeds. In return, his Lordship asked for cranes, dogs, frise, and usquebagh to he sent to him in England. One letter, dated July, 5665, states?" I pray acquaint John Totnal that I desire him to get some bee-hives at the Tunny Park. "?Rawdon Paters. The family of Totnal is now extinct in Ballinderry, but there is a fine armorial stone of theirs at the Middle Church. There is a short paper by F. J. 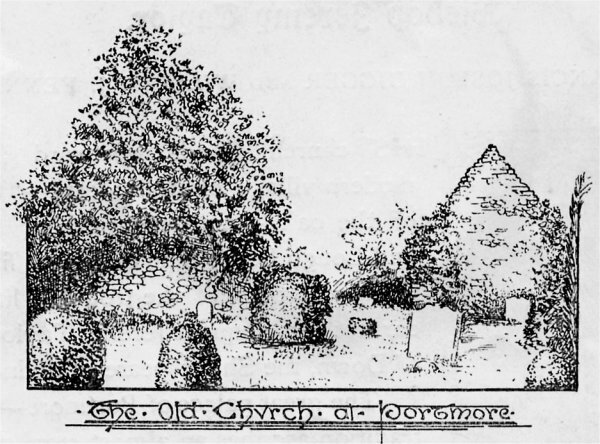 B. on the armorial stones of Ballinderry, in the Report for the year 1893 of the Fund for the Preservation of the Memorials of the Dead, page 249. 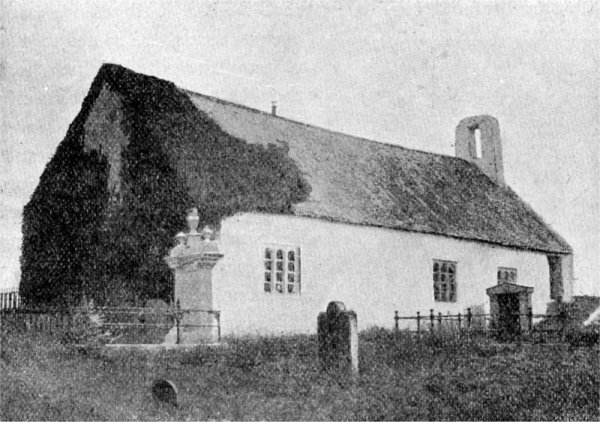 Close by, in the marshes on the west side of the shore, are the remains of the first Church of Ballinderry, known locally as the Church of Portmore, or Jeremy Taylor's Church. It is now a ruin consisting of only two gables sixty-three feet apart and twenty-nine feet wide, but devoid of any architectural feature of interest. The site claims some attention, being like an artificial island in the centre of a bog, surrounded by a fosse, and lined with a double hedge, which adds wonderfully to the picturesqueness of the spot. This was the church in which Taylor officiated first, and which Heber calls the " half-ruined Church of Killultagh." It was no doubt a pre-Reformation church, and close by it in the graveyard are two rude basins hollowed out of boulder stones. 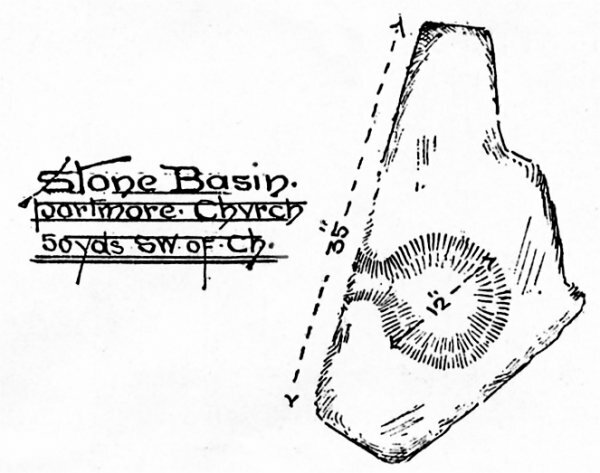 Bishop Taylor found this church inconvenient, and caused another to be erected nearer the village, now known as " The Middle Church." 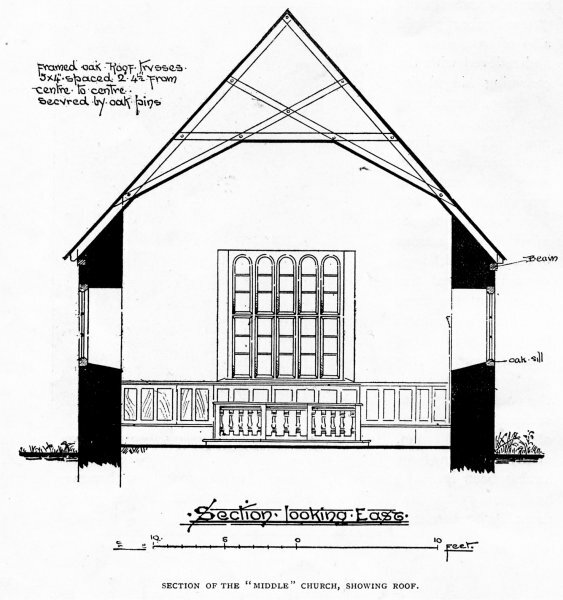 In 1823 it was decided to build the new church on the site of the Middle Church, which, however, was subsequently overruled, and the present site adopted after a considerable amount of discussion - the Vestry Book records the question having been " three times put." 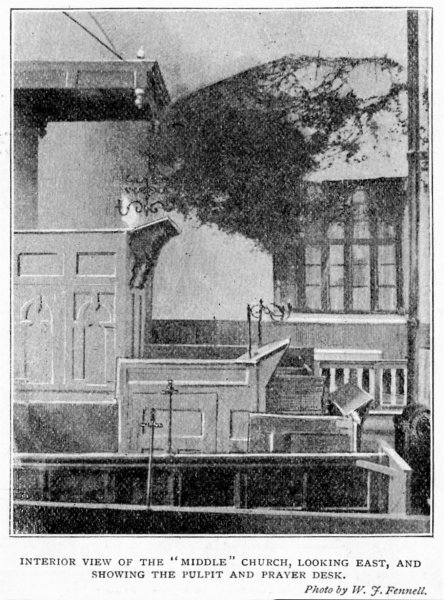 In 1824 the Middle Church was abandoned for all but mortuary and other occasional services, and the present Parish Church erected, which, with its gracefully proportioned spire, forms a pleasant picture as seen from its less pretentious parent, the subject of this paper. 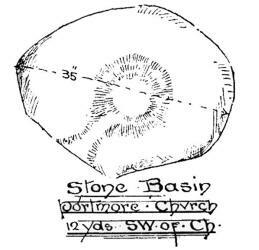 In 1834, as appears by the Parish Records, "it was resolved that the old churchyard at Lower Ballinderry [Portmore] shall be properly fenced, and an iron gate and pillars placed on it." T his quaint little whitewashed church arrests our attention, with its circular-headed mullioned windows, its empty bell cot, and its chancel end loaded with ivy spreading out over its wrinkled old roof. 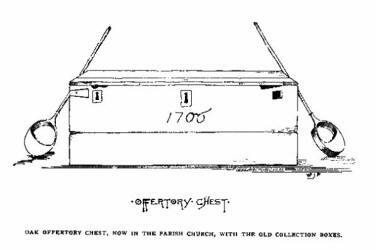 Here are tangible relics of Jeremy Taylor's life and ministry, which should be most carefully preserved and cared for, and pointed out to hundreds to whom the name of Jeremy Taylor is more than an empty sound. 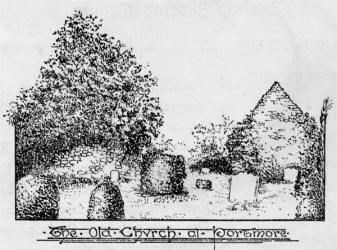 The church stands duly orientated on the south side of the county road, in the centre of its graveyard, on the crest of a small hill. It is seventy-one feet long by twenty-nine feet wide, solidly built of masonry three feet thick, low to the cave, roughcasted and whitewashed ; but its details, though scanty, bear the charm of the style which flourished in the middle of the seventeenth century. 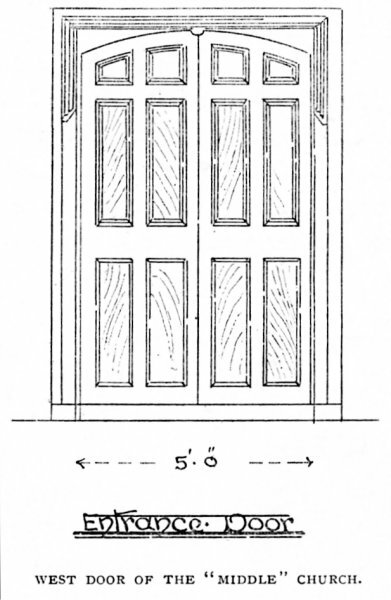 The windows are constructed of oak, with mullions, transomes, and circular heads, each having three lights, except that in the chancel, which has five, and all are glazed with sheet glass. Entering by the door in the west gable, we see at once the unchecked hand of decay hard at work on what was once a beautiful little country church of a style distinctive and unmatched, our solitary example of a purely Jacobean structure. 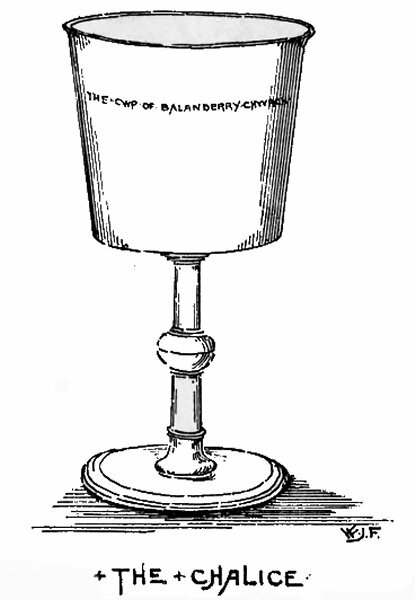 1The News - Letter of 19 April, 1763, contains the following advertisement :?" Sale of Portmore. Good old oak in Portmore deer park, scantlings, timber of stables. The bricks likewise." This date was the year of the church's consecration, and the initials may represent the names of the first churchwardens. 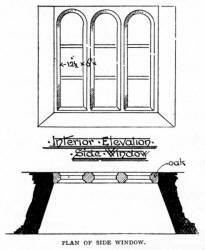 The chancel rail is comparatively modern, but the east window was boldly worked in solid oak. Here the ivy has forced its way in, and nearly covers the inside of the east wall as well as the outside, making a picturesque effect, but adding much to the general decay. The roof is peculiar, and worthy of note. 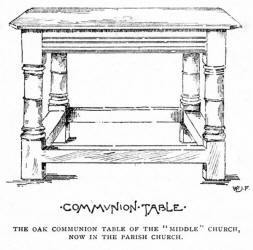 It consists of oak rafters five inches deep and four inches thick, framed and trussed together, and held with strong oak pins at the meetings. These trusses are spaced two feet apart, and are sheeted longitudinally over to carry the slates, which are exceptionally small, and appear to have come from Aberdovey, in Wales. At an earlier date oak shingles were doubtless used, and this is borne out by local tradition. In 1791 an applotment was made on the parish of " one penny per acre for the sake of slating the church." The ceiling is lathed and plastered on the underside of the cross timbers of the trusses. This roof seems to carry the conviction with it that it was brought from the old church at Portmore when that building was abandoned, as it is just of such character as would be in keeping with it, and was intended to be open to view on the inside from the plate to the ridge. In fact, it is quite open to conjecture that some of the other fittings were brought from Portmore as well. 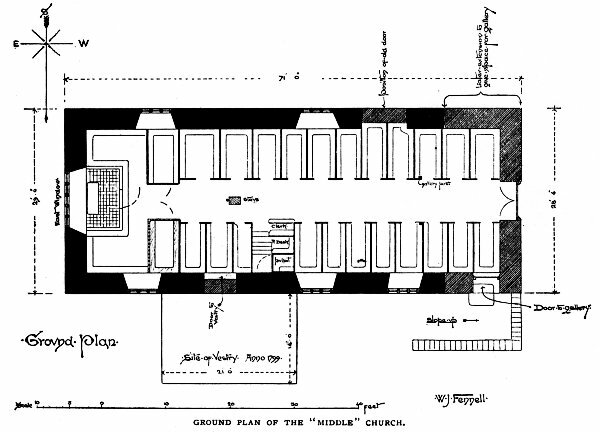 The examination of this roof, the walls, and the general arrangement of the west end, points to the supposition that the church was at some period subsequent to its foundation lengthened westward by nine feet (see plan), for the special purpose of obtaining room for a gallery which now exists, and is entered from the north on the outside by an inclined terrace. 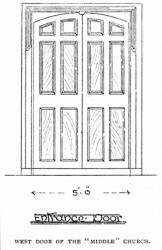 The door appears to have been on the south side at one time, but was moved to the west when this extension took place, and the present door replaced in 1808 at a cost of ?4 16s. 9d., as appears by the Vestry Records. 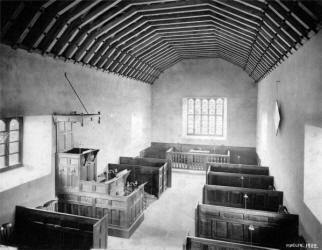 Middle Church, as a new one has been presented to the Parish Church. 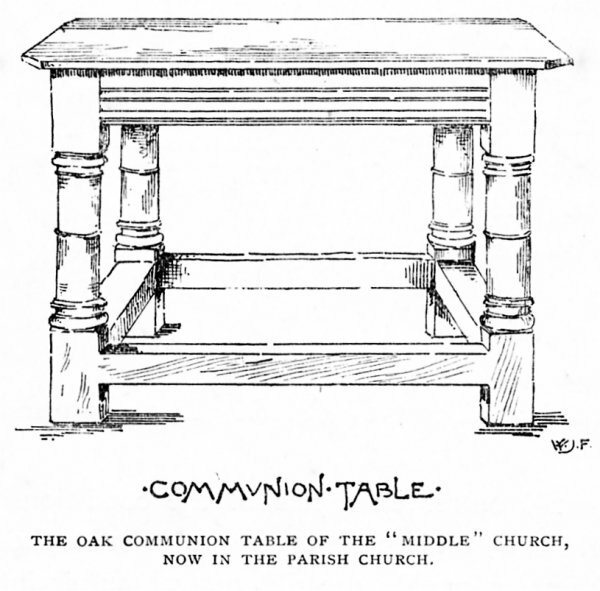 The pedestal is made out of one solid piece of oak, with a circular stone basin ; the cover is also of oak, neatly clasped with wrought iron : both are illustrated in the initial to this article. 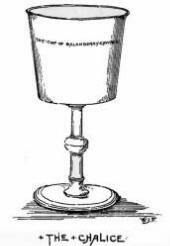 Only one piece of communion plate is now preserved, being the chalice still in use. It is inscribed? 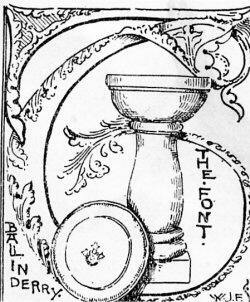 and from the hall mark was doubtless locally made about the middle of the seventeenth century. 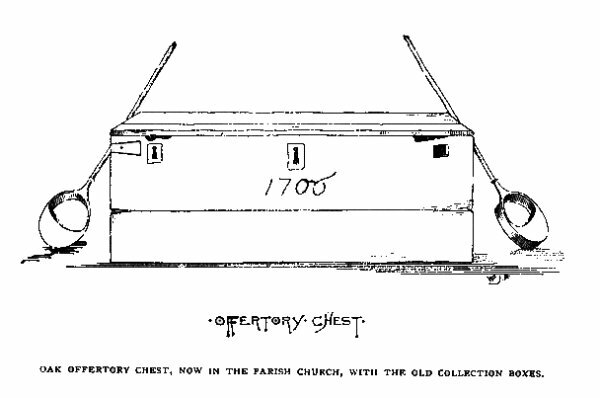 There is only one other relic of interest, and this is a fine oak offertory chest, about four feet long, one foot five inches high, and the same in depth, double locked, containing three compartments inside, the centre one being for the offertory, with a coin slot in the lid, and bearing the date 1706 on the front. This is now in the vestry of the Parish Church, and is illustrated as a tailpiece to this article. It is locally believed that Jeremy Taylor wished to be buried in his new church at Ballinderry, and that a grave had there been prepared for him ; but it was not to be?he sleeps his last sleep in Dromore, as he had himself desired, for we are told he said on his deathbed?" Bury me in Dromore "the cathedral he had done so much for, and his will contained a provision that he should be buried in Ballinderry "in case it should be consecrated before his death." It was not consecrated until 1668, the year after the Bishop's death. The church has now lost much that made it perfect in early times, but enough remains of its character to make it valuable and full of interest to the architect and the arch?logist, as well as to the Irish historian?an interest heightened by the mystic charm that links it with the times and life of that great scholar whose works are "enduring monuments of sacred eloquence," and who, while he laboured in this out-of-the-way spot, and preached in his own little church at Portmore, " gave full reins to his imaginativeness, unmatched alike in ranges of illustration and in opulence of language." It is said "the solemn music of his words, the rich beauty of his imagery in his incidental metaphors, and the tenderness, passion, colour, and force, if not precision of phrase, combine to place these writings by themselves on a level scarce attained by all the Asiatic eloquence of Chrysostom." To the Rev. 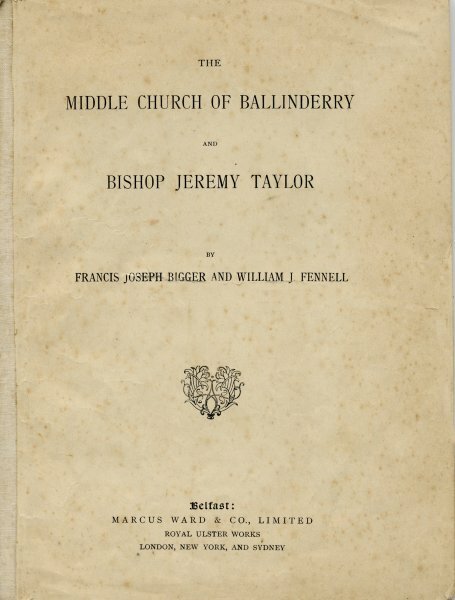 Canon Sayers, Rector of Ballinderry, we are much indebted for kindness and assistance rendered to us in the compilation of this paper. WITH THE OLD COLLECTION BOXES.